Stay home and decorate the house for Christmas or go walk along a river with a chance at catching a steelhead in a “picturesque” setting? That kind of question doesn’t take much processing time for me. The twins decided to stay home with mom and decorate the house while Kolby decided he was up for a long walk in the snow with me. We headed to the Wallowa for the day and decided to bring our border collie Molly along as well. Ed, one of our Jack Russell’s, really wanted to come and he snuck out the door when it opened. I had a hard time getting him out of our car so we could leave. Each time I would go to pick him up he would jump into the other seat. I felt bad for leaving him behind, but the snow is deep and we were planning on going quite a ways for the day. When he gets into deep snow he has to leap like a deer to keep going, it is quite entertaining to watch but I was afraid today’s trip might be too long for him. Let me just say I can’t wait until we get past December 21 (the shortest day of the year). Granted the days may not grow longer very fast, but I know they are getting longer and that is enough to cheer me up a little in the dark days of winter. Between ice and snow covered roads that require slower driving and the short length of the day, it can be hard to get much fishing time in right now. If you add a hike into that the fishing time dwindles even more. I like the hiking part though. It is a good way to keep in shape. It is too easy to get fat and lazy in the middle of winter. So Kolby and I slowly made our way over the mountain to search for some Wallowa steelhead. We decided to head to Palmer Junction and hike the 3+ miles to Rondowa (the confluence of the Wallowa and Grande Ronde). The furthest up the Wallowa we had been before was up to Kimmel. Vincent and Howard Creek weren’t that much further upstream so we stopped at Howard Creek and began fishing our way back from there. On the way down, the Grande Ronde was running very brown. With the few days of warmer weather, a lot of the snow has been melting and this section of the Grande Ronde went from having ice in it to being full of dirt. The Wallowa on the other hand looked great. I wont say that it was crystal clear, but it was pretty clear. With roughly 7 miles of river to cover to get back to our vehicle we didn’t get to fish all of the good water on the way back. There is a good bend or two in the river between Howard Creek and Kimmel and I really just wanted to see what the river was like in that section. There was no disappointment either. There was plenty of good water to fish, I just needed more time to fish it. We fished our way through pretty fast, I wanted to make sure we were back to Rondowa at least by 3:30 since it was getting dark between 4 and 4:30. We skipped several good looking sections of water so we could keep covering the miles at a good pace. 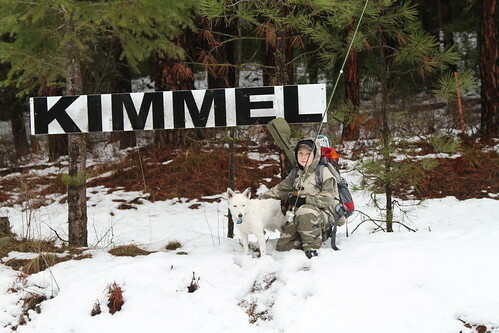 Kolby fished a little, but he seemed more content to play in the snow for the day than fish. His hands got pretty cold from the snow but I pack some chemical hand warmers in my pack just in case and Kolby put them to good use in his gloves and was happy once again. Just downstream of Kimmel I did finally hook into a Wallowa steelhead. Kolby became very excited and kept telling me that he hoped it was a hatchery steelhead. I wasn’t real sure why he kept putting the emphasis on the hatchery part until I got it to the bank and he pulled out his new pocket knife he had received as a Birthday present at the end of November. He then eagerly asked if he could gut the fish with his new pocket knife. Now I understood why he so badly wanted it to be a hatchery fish. “OK,” I said, “But your hands are going to get really cold again. Are you sure you want to do it?” He assured me that he could handle the cold. Kolby had the fish mostly gutted before he was shaking his hands in the air. I mistakenly thought he was trying to shake the fish’s blood off his hands. I told him to wash his hands in the river to get the blood off, but then he explained he was trying to warm his hands by shaking them. I took over the final cleaning at this point and had him put his hands back in his pockets where his hand warmers were. Well we made it back to Rondowa by 3:30, but that still left 3 ½ miles to go to get to our vehicle. We walked in the dark much of that way. Kolby kept up a good pace until we got down to the last mile and a half. At this point I had to stop often and tell him we were almost there. He is a pretty good trooper though and rarely complains. To tell the truth, I was feeling that last mile and a half pretty good myself. I still wasn’t over my cold and my body was telling me the same. It always feels good to get out and walk though. Especially when you get to do it in a snow covered canyon with eagles flying overhead and steelhead resting in the water that winds through the canyon. This entry was posted in Wallowa River. Bookmark the permalink. I thoroughly enjoy reading your site, which I discovered a few days ago. Makes me feel cabin fever even worse these days. I was wondering too, whether there are still fish in the imnaha and wallowa these days, especially with the Grande Ronde being as flooded as it is. Is there any (fishing) point in going out there this weekend? There will be fish in them. I tried going out right at the start of the warm streak we got and there was still too much ice. Then as you say, everything has been at or near flood stage lately. Looking at the streamflow tables you might try the Wallowa above the Minam/Wallowa confluence. The Minam is still pretty high, but the Wallowa above Minam looks decent on the streamflow chart. Only one way to find out for sure. Thanks Grant. Gonna try to convince the overworked girlfriend it’s worth it I will let you know how it goes, if I go. Hey Bob, how did you do? 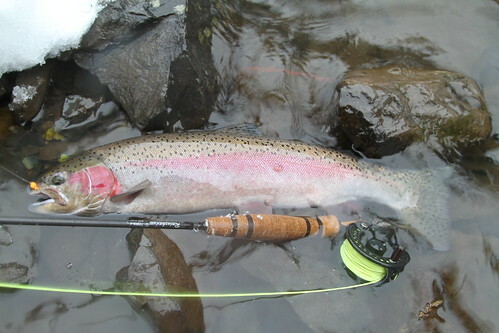 I hit the Ronde on Saturday a couple hours and did some spey casting, but the flows were horrid in Washington. All in all thanks for pointing out that gorgeous piece of river! I enjoyed the hike and the fishing a lot. I was also surprized at the number of people down there – such is steelhead fishing I guess. Grant, I have enjoyed reading your stories, The wife and I had discovered the Wallowa for the first time last yr. Have lived in Pendleton my whole life and like your family we do everything pretty much on a weekend basis, but until last spring never headed into the Wallowas. Since then we have caught steelhead there, hunted turkeys, camped up the lostine, Elk hunted the Minam unit, and this last weekend fished the Imnaha for the first time. I might as well move and get it over with…lol. Anyway, keep writing, we have some beautiful country to talk about. Luckily, Pendleton isn’t too far. I think you are pretty close to the same distance away from all those places as me. Since Christmas I have been working on remodel projects which has left no time for getting out. There has been some decent weather and flows are pretty good right now as well. I was down at Minam today although I didn’t have anytime to fish. The Wallowa looked decent and people were catching some fish. I am planning on getting out next weekend before President’s Day, although the temperature will be dropping back down a little bit.